When building a playground, it’s important to realize you’re going to need money for more than equipment. Your budget should also account for surfacing, installation, maintenance and more. The price tag can quickly escalate, and of course you don’t want to cut corners. You want to ensure you’re giving children an amazing, inclusive and fun play area to create a lifetime of memories. 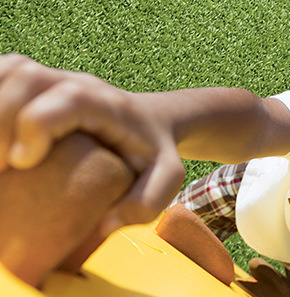 Playground equipment fundraisers help you raise needed cash so you can set up your perfect playground even if you don’t have the capital right now. You may still need to fundraise to cover the total costs of a new play area if you get money from grants and foundations as well. There is often money available right in your community — resources to help you make your playground a reality. Around the world, 1.4 billion people donated money in 2014 alone. And while big companies might have PR teams expounding their charitable donations, the majority of giving — 72 percent of all charitable contributions — comes from individuals. There are dozens of school playground fundraising ideas to get money flowing into your coffers, but while stand-by options like bake sales and car washes might work, your playground project might deserve a more unique approach. Creative ideas typically gain increased traction and attract more attention. When you take the time to come up with a different kind of fundraiser, it may be easier to attract people, which can mean a better turnout and better results. Unique ideas are also important because of competition. Your community members aren’t just being asked to donate to your cause. The number of non-profits increased 54 percent between 1999 and 2009 alone, and the number of organizations asking for donations is growing. Some of the non-profit groups asking for donations in your community have extensive marketing budgets and celebrity names behind them to get people to open their wallets. To get your community members donating to your cause, you need to have a strong cause they can believe in — and having a fun and innovative idea can also make an impact. Your playground may have a fence around it, and you can literally sell space on the fence to donors. Donors can have their names printed on the plats of the fence if you have a picket fence. You can also sell bricks or other parts of the playground. You’ll need to have volunteers come up with flyers or an online campaign to gather donations and to keep track of what each donor wants printed. If it will take some time to build your playground, consider setting up a blog, social channel page, and/or a regular newsletter to keep donors aware of when “their” fence is being built. You will need to hire a professional to engrave the names and messages on the fence or bricks, so when determining how much to charge per fence piece, you’ll need to factor in this cost. If the budget allows, consider renting an inflatable outdoor screen and selling tickets to a movie showing. To decide what events to include, take a look at your financial resources and your volunteers. What are everyone’s talents? Make a list. If you have a “strong man”, consider an arm-wrestling competition. If someone in your group can bake, include a bake sale. If possible, host your event near or in the space where your playground will be, to create more interest in the project. Distribute pamphlets about your fundraising efforts to people who show up and have a rain date in place. 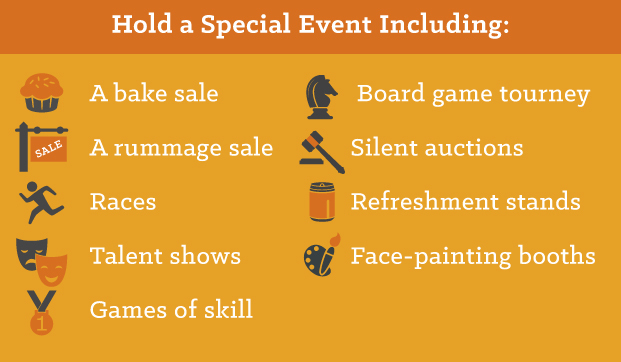 Special events and fairs can be a lot of work, especially if you plan on many booths and activities, but they can also raise a lot of money because there’s an event for just about everyone. Ask for donations from local businesses and hold an auction for the items you receive. An auction can be held online if you want to garner donations from beyond your community, or it can be held live. If you decide to hold your auction online, review the rules for auctions and raffles in your state and take a look at delivery costs for winning items to make sure the donations will be worth the extra expense. Auctions work because they let you get more for an item than you would receive just by selling it. You can make even more from your auction by combining items. For example, if a bookstore donates a basket of books, consider having one of your volunteers offer to do a public reading or to offer a writing workshop. If a business donates a food basket, throw in a book of recipes or a certificate to a cooking class. Combining items makes them more attractive, meaning you can get more for each item. If you struggle getting enough donations from businesses, auction experts’ time. Check to see what skills your volunteers have. Someone can auction off barbecue lessons if they’re known for their grilling skills or gardening help if they own or work at a landscaping company. You can also make an event of the auction itself, selling refreshments and hosting a raffle sale to bring in extra cash. If you have the space and the volunteer power, this can be another way to get more money for your playground. Sell advertising space on the playground to local and national businesses. In exchange for a donation, companies could buy a custom sign or plaque on the playground, for example. Asking for advertising space can ensure you receive funds — potentially even a considerable amount if your playground is in a higher-traffic area that offers prime advertising space. Some communities have bylaws about advertising. Before asking businesses, make sure to check with a legal professional to find out whether you can sell ad space in the playground. You might also want to hold a community meeting to air out any opposition to the plan. If advertising space seems like a feasible idea, contact businesses directly with professional letters and emails. Companies selling to children and parents will usually be the ones most interested in these types of projects. Before the event, make sure to print out a map of the playground and ask the community to come out to play. At the event, consider selling refreshments or other items to make even more money. Kids love to put on a show. Have kids put on a show – fashion singing, talent or theater production (ideally in the spot where the playground will be located). Families or businesses can donate simple props and costumes, while children can sell refreshments. Well before the event, make sure to hold rehearsals and advertise through social media and printed flyers. Print programs of the show and consider selling advertising space on the programs to businesses. Shows can create memories and generate a lot of interest in a playground. Since children are directly involved, it can be easier to get an audience. At the very least, you can be certain the parents and family members of the participants will show up or volunteer. With children at the core of the show, it becomes easier to build a community spirit around the program. Obtain donations from businesses or individuals to make surprise gift boxes (or one really big surprise box). Sell tickets and raffle off the prizes. Mystery boxes are a step up from raffles, and they work because many people like to be surprised. You can create even more interest in your mystery box event by wrapping up the prizes elaborately and displaying them — either online or wherever the tickets are sold and the drawing will be held. If you have one big prize, give it a prominent spot and wrap it up with a huge bow on top. To encourage ticket sales, consider writing down the “estimated value” of each prize. This way, people will know they’re getting something valuable for their money, and it may encourage them to donate. You can also create riddles to hint at what’s inside. For example, if tickets to a sporting game are donated, create a sports-based riddle and wrap the tickets in a big box with sports-themed wrapping paper. This way, sports fans will know to buy tickets for that specific mystery box. Have an adult in the community volunteer to do “something”. This works best if it’s someone with authority — a principal, teacher, mayor, fire chief or police officer. Advertise that if a specific fundraising goal is set, the adult volunteer will have to undergo something slightly embarrassing. Then, sell tickets for anyone who wants to watch a part of the fun. For example, sell tickets to have people watch the principal shave his head. The tickets can even be used to sell part of the event itself. For example, every ticket sold gives participants a piece of sticky tape they can use to help wrap up a teacher or a soft ball they can throw at the mayor in a dunk tank. At the big event, sell refreshments and or photo opportunities with the volunteer. If you can group together several booths at one big event, you can get more interest and have more people stopping by to check out the event. Since playgrounds are about encouraging activity, it makes sense to raise money with an event that gets people moving. Sell tickets for a bicycle ride, relay race or a walk, and then have the community come out to take part. It’s a simple way to encourage physical exercise and raise money in the process. To make it work, advertise the bicycle ride, race or walk. Have details about where someone can pay an entry/registration fee to participate in the event. Consider giving away prizes or other incentives to encourage people to register. It can be especially effective to make the sporting event attractive to children, too. For example, a teddy bear bicycle ride — where everyone rides their bikes together and brings their teddy bear for a ride — will usually pique the interest of kids, meaning more participants and more fun for everyone. 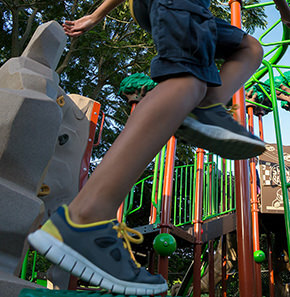 Building a playground is a large undertaking and raising funds is a project of its own. 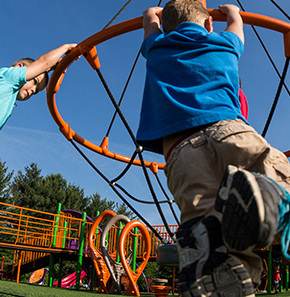 Hopefully, these fundraising ideas for playground equipment and accessories will give you a head start on raising what you need. 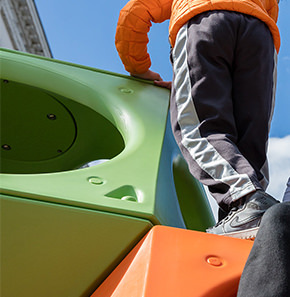 If you’d like more information about playground fundraising, playground equipment leasing, grants and playground equipment, contact your local Playworld representative who can guide you through the whole process of funding, designing and setting up your playground.